Milder climates during the so-called winter months leaves one with this beautiful Diane von Fürstenberg jumpsuit as an option for so many occasions. One could wear this jumpsuit to lunch with the ladies, shopping, or to various daytime meetings. I also think it is a perfect island vacation outfit. It can be worn on the airplane so that you arrive in style. The jumpsuit is perfect for beachside romantic dinners or daytime shopping excursions. It is a very versatile piece that can be worn either in daytime or evening depending on the way its accessorized. 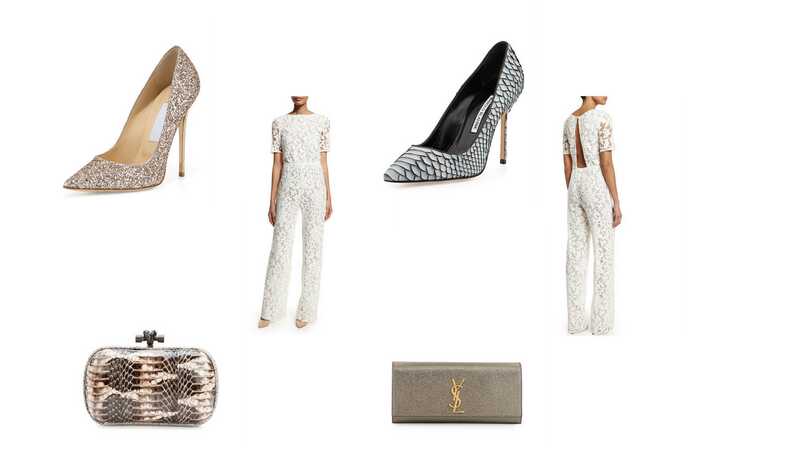 The accessories that I have chosen for the jumpsuit in the above collage are for an evening look. For a daytime look, I would have chosen wedge shoes or flats and a more casual bag. For the evening look, I selected the Jimmy Choo and Manolo Blahnik pumps in neutral colors so as not to draw focus away from the jumpsuit. Instead, choose either of these pumps to complement the jumpsuit instead of taking away from its beauty. I also chose two neutral evening bags or clutches. I personally prefer the Bottega Veneta Snakeskin Knot Minauadiere because it has more visual interest. Of course, either bag goes with either pair of shoes as all the accessories are neutrals. This white jumpsuit is a perfect way to brighten your winter whether you live in a warmer climate, are visiting warmer temperatures, or are experiencing warmer temperature where you live. It is a conversation piece that your friends, family, and maybe some strangers, will love!